Jack’s has replacement commercial Exmark pulleys including Heavy Duty Cast Iron Pulleys and Variable Speed Pulleys. When you need to help you get your Exmark equipment repairs under way, check out Jacks first. 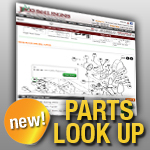 With over 1.4 million parts online and fast shipping!